Note: The following is archived material, and will not be updated. It may not account for changes in the law that have taken place since publication. Libel is for written publications and broadcasted material (so covers virtually all newspapers, TV and radio stations. Libel is what people would sue you for, not defamation. Slander is for spoken or ‘intransient’ statements that are defamatory and again identify the subject and have been published. 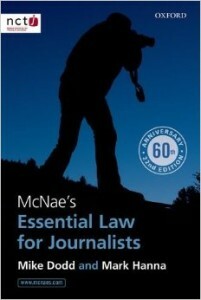 McNae’s Essential Law for Journalists is a real must-read if you want to get into the world of journalist. Copy editors all the way up to sports reporters, features writers and editorial teams in the world of journalism will be required to prove they know all about it. If you’re ever in doubt, always consult with a media law solicitor. The SPA, Sheffield Students’ Union, Forge Media and Jon May can not be held responsible for the (in)action caused by the use of this information and training.